This Problem Article describes issues you may encounter when moving label design from one computer to another, upgrading to the newer version of the software or changing printer. This is a fairly common issue. The easiest way to remedy this problem is to export all of the fonts from the old computer and install them on the new computer. If prompted to overwrite exiting fonts, say no. If you are using CODESOFT, LABELVIEW or LABEL MATRIX from Teklynx, you need to be aware that there are printers that are available only from inside the software (i.e. embedded drivers). In TEKLYNX labeling software, these printers are denoted with a printer icon in front of their names. For the purpose of this article, we will refer to these printer as TEKLYNX Printers. The small printer icon next to the printer indicates this is a “TEKLYNX Printer” (i.e. embedded driver). Bottom three printers are TEKLYNX Printers. The six above them (without the printer icon) are Windows printers (i.e. using Windows printer drivers supplied by the printer manufacturer). Nearly all printer manufacturers in the market offer Windows print drivers either on CD with the printer or downloadable form the manufacturer website. This allows the printer to be used by most Windows applications (e.g. Word, Excel, Notepad, etc.). The printer manufacturer will usually offer several choices in Windows printer drivers. The best Windows drivers for your use will depend on the printer model and operating system version of the computer used for executing the print jobs. Your new computer will likely not have the same Windows drivers as the old computer. Therefore you may be tempted to add the printer from inside the TEKLYNX labeling software application. When you add a printer from within the TEKLYNX labeling software application, it will add the printer as a “TEKLYNX Printer”. Therefore, if you used Windows drivers on the old computer for printing your labels and install printers (i.e. printer drivers) on the new computer through the TEKLYNX software, you may inadvertently be switching from Windows drivers to TEKLYNX embedded drivers. Both Windows and embedded drivers offer their own unique benefits. One may or may not be superior to the other in a given circumstansce. However, changing from one to the other, even for the same printer, is likely to change how the label looks and prints. We recommend sticking with one or the other driver type (i.e. Windows or embedded)and not making a change during an upgrade or migration process. When you move your software to a different computer, chances are that your are doing this to upgrade the software and/or the computer operating system. With a newer operating system, the Windows printer driver for your printer may be different version than the one used on the old computer. If you are upgrading the labeling software and using embedded drivers (e.g. TEKLYNX Printers) the embedded driver version may be different as well. It is unlikely that a different driver version will change the label appearance. However, it is possible and a different driver version is something that should be taken into account when troubleshooting. A different printer driver (either driver type or version) may support printer fonts (i.e. fonts residing in printer memory) differently. If you are using printer fonts and the printer font is not available in the new driver, the software may switch to a different font automatically. This will make the label on the new computer look vastly different from the one on the old computer. Check the label design on the old computer to see it uses printer font and barcode font. In some case, on the new computer, when using the same printer driver, the printer fonts may be different. The impact of this issue can be very dramatic. 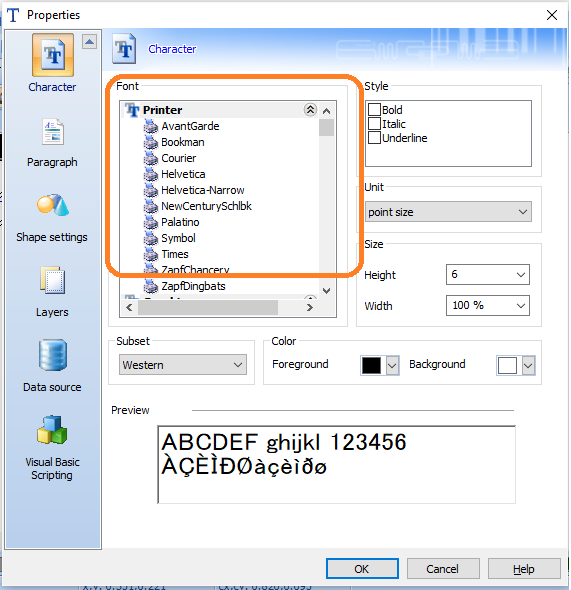 In TEKLYNX labeling software, use of printer fonts is indicated by a small printer icon next to the printer font name. Does the new computer support all the Windows fonts used by the label on the old system? If not, those fonts will need to be loaded on the new computer. Click here for how to do that. Are you using the same printer driver? If you have inadvertently switched from Windows to embedded drivers, it is probably easiest to load the same Windows drivers on the new computer and switch it back. Did the settings in the printer driver change? If using Windows drivers, you will likely need to compare settings from the old and new systems.